One of many of the amazing images by my good friend Sue Eatock. See her wildlife writing here. One of the weirdest trees growing naturally in Spain is the Dracaena draco, the Canary Islands Dragon Tree (Drago in Spanish). Reports of one thousand-year old specimens are somewhat exagerrated. 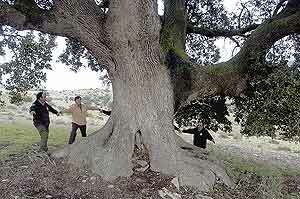 The tree, shown above at Icod de los Vino, is thought to be the oldest in the islands at a sprightly 650 years. The tree ‘s name has mythical origins: for his 11th labour, Hercules had to bring back three golden apples from the garden of the Hespérides, which is guarded by Landon, the hundred-headed dragon. Hercules killed Landon and his blood flowed out over the land, which began to sprout ‘dragon’ trees. Arkive. The origin of this tale lies in the tree’s resin: When the bark or leaves are cut they secrete a reddish resin, one of the sources of the substance known as Dragon’s blood. I’m not sure how much it has rained in Tabernas itself but Andrés informs me that rainfall records have been smashed in Almeria capital this winter with some 400mm falling in just two months. Browsing through his site I can see it is not only about flora. It is also the best guide in English on the nature and geography of Almeria in general. Dutch elm disease (grafiosis in Spanish) arrived relatively late to Spain. It was first detected in the 1980s, though it may well have reached the country a decade before, and has decimated 80-90% of common elms (Ulmus minor) in Iberia. One of the very few elm stands to have survived in Spain is in Rivas Vaciamadrid, near Madrid, as it is isolated from other trees. Efforts are being made here to conserve the trees here and ensure a genetic bank from which one day to replant elms across the country. Fascinating article by Clive Muir and Sue Eatock on the dangers of oleander (Nerium oleander) which at the start of summer flourishes luridly along Spain’s riverbeds and motorways. Despite its use in municipal planting schemes and private gardens this plant is extremely toxic.